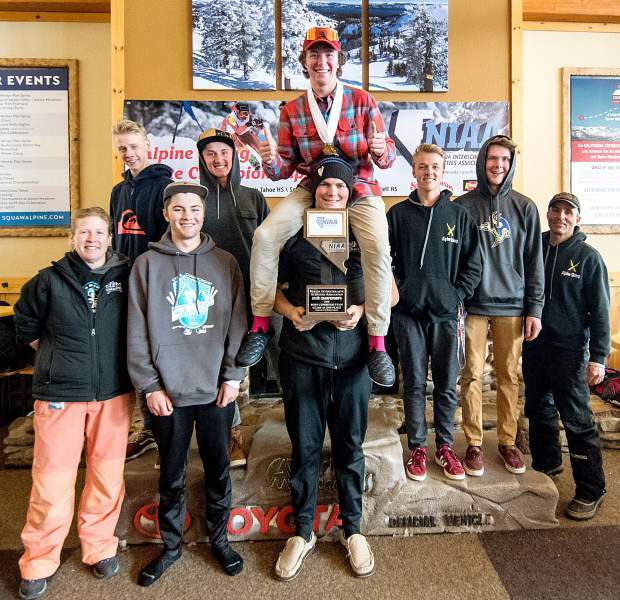 The South Tahoe Vikings boys alpine team took second place overall in slalom, giant slalom and the combined Tuesday, and Wednesday, Feb. 27-28, in the Nevada State Championships at Alpine Meadows. Whittell’s Payton Norton swept the Nevada Interscholastic Activities Association Alpine State Championships this week, and South Tahoe also added some hardware for its trophy case. 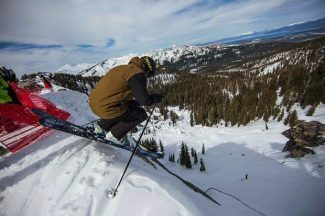 The two-day state championships, Feb. 27-28, took place at Alpine Meadows and came between storms. The slalom race on Tuesday was a little tricky with a fresh foot of snow from the night before. 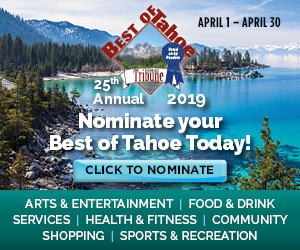 The racers made several trips down the course to push out the soft snow and expose the harder pack underneath, said South Tahoe head coach Barbra Bedwell. “There were definitely some advantages to starting fairly early in the rotation, just after the course got set but before the ruts got too deep,” Bedwell said. The course Wednesday was in better racing shape and Bedwell said her racers didn’t think it was too difficult compared to the day before. Norton, a senior, won the slalom race and finished in a cloud of powder spray while crossing the finish line. He doubled up the next day in giant slalom. The South Tahoe boys added three trophies to the case by finishing second in the slalom, giant slalom and combined. 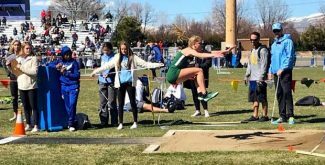 The North Tahoe boys and girls swept first places in all three events. Luke Allen, a junior, vied with Norton for the overall title in each event and finished on the podium by earning third in both. Douglas senior Sean Dunkelman came in second in both events. Allen has competed with Norton and Dunkelman for several years and will be especially hard to beat next year as a senior. Also scoring for the Vikings in slalom were Mark Allen in seventh, Logan Langemeier in 10th and Cameron Grant in 14th. Noah Lyle and Aaron Johnson were 15th and 16th, respectively. The South Tahoe girls also participated as a team and finished in third place out of three teams. Lyndsey Allen finished 17th on both days to lead the Vikings. Summer Furrer was 16th in slalom and 22nd in giant slalom. Carissa Buchholz was 20th on both days and Kelsey Buckley was 21st in slalom and 18th in giant slalom. While all the skiers were competitive, Bedwell appreciated the camaraderie between the athletes and coaches. 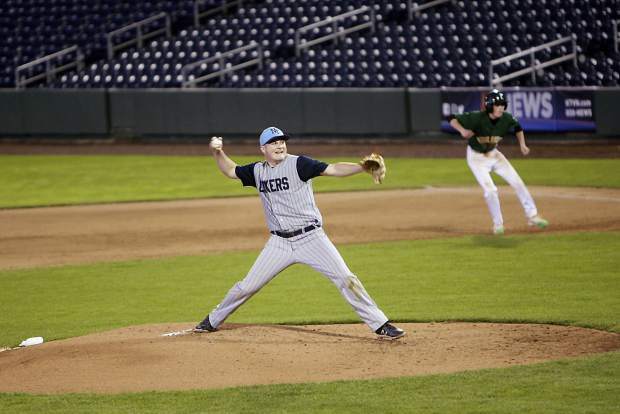 It also was the last time competing for the seniors, maybe ever. Norton hopes to ski in college but for Lyndsey Allen, Shelby Lyon, Langemeier and Foster Saunders, it may have been their last races. Langemeier will play division I football next year at Jacksonville University in Florida. “I spent a lot of time with my seniors trying to remind them to savor the moment, it was their last race, probably of their life,” Bedwell said. Full team results for the boys’ slalom are North Tahoe 205, South Tahoe 194, Douglas 177. In giant slalom it was North Tahoe with 202, South Tahoe 195 and Douglas 176. For the girls in slalom, North Tahoe had 218, Truckee had 193 and South Tahoe had 154. In giant slalom, North Tahoe had 212, Truckee had 203 and South Tahoe had 151.